On the Kindle Fire HD, Favorites is a place for saving frequently used content which takes the form of a pop-up display. The concept of Favorites is probably familiar to you from working with web browsers, in which Favorites is a feature that allows you to put websites you visit frequently in a Favorites folder. 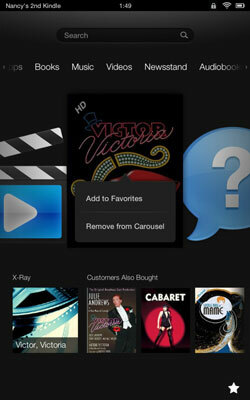 When you’re on a roll using Kindle Fire HD for accessing all kinds of content, the Carousel can get a bit crowded. You may have to swipe five or six times to find what you need. That’s where Favorites comes in. If, for example, you’re reading a book you open often or you play a certain piece of music frequently, place it in the Favorites area of the Kindle Fire HD, and you can find it more quickly. 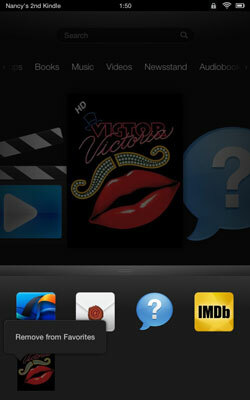 By default, Favorites includes the Silk browser, the E-mail app, Help & Support, and the IMDb movie database app. To pin an item to Favorites, press and hold it in the Carousel or a library, and then tap Add to Favorites from the menu that appears. To remove content from Favorites, tap the Favorites button (the star in the bottom-left corner of the screen) and, in the list of Favorites that appears, press and hold the item you want to remove and then tap Remove from Favorites from the menu that appears. Remove from Favorites unpins the item from Favorites, although it’s still available to you on the Carousel and in the related library. Delete removes the item from the device (although it’s still archived in Amazon’s Cloud).